As one of the greenest capital cities in all of Europe, Madrid is a must-see. But beyond having more trees per resident than other EU countries, there are also tons of things to do in Madrid that aren’t just about taking in the great outdoors. Madrileños—what they call people in Madrid—have a great way of savoring things. You’ll see it with sleep (they wake up late and take daily siestas), with their paseo (a leisurely walk about town), and with their elaborate lunches (their big meal, which is often served in several courses). And there’s a lot to take in: delectable food, an energetic nightlife, and an array of cultural delights. You see, Madrid may not be considered as quintessentially Spanish as other cities, but it has a charm of its own. From bullfighting to The Golden Triangle of Art to sleeping in and staying up late, it’s easy to see why los gatos are enchanted with their city. Keep scrolling for 15 fun things to do in Madrid that won’t be the same anywhere else. 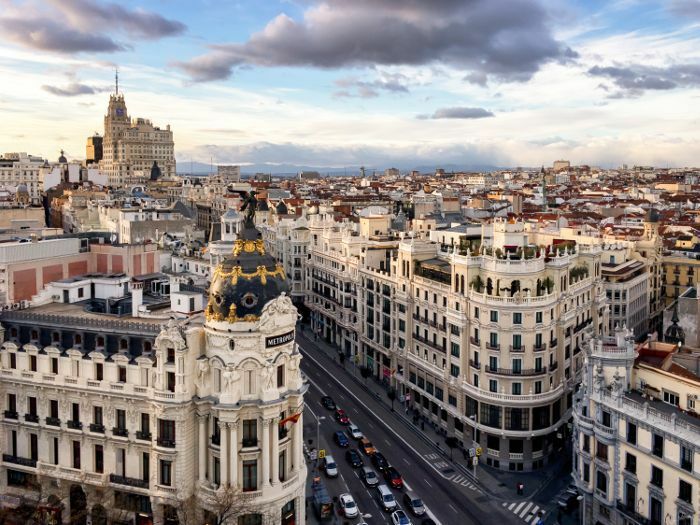 Out of everything, Madrileños are the proudest of their three museums, dubbed “The Golden Triangle of Art.” They’re composed of the Prado, the Reina Sofía, and the Thyssen-Bornemisza. The rule of thumb is that you need at least one day in each museum since they are so extensive (purchase the Paseo del Arte for $39, and you’ll get admission to all three). The Prado has collections of the masters like El Greco, while the Reina Sofía boasts more modern artwork like Picasso’s Guernica (you will see people weeping in front of it), and the Thyssen-Bornemisza is probably the most diverse and includes favorites like Monet and Dégas. Tapas is the thing to do in Madrid; some people even say it’s more of a cultural necessity here than in Barcelona. FYI, the small plates come differently than they do at a tapas bar in the States—with every round of drinks you order, a round of tapas will be served with it. The first round will usually be something like papas bravas (home fries in an aioli) or some take on bread. Pro tip: Go to two tapas spots in one night, and stay for about three rounds each. The tapas get better and better with each round, and this way you’re getting to take in a varied selection. If you don’t know where to start, El Tigre in Chueca is always a good option, or you can just wander down Calle Cava Baja and hop from bar to bar. Madrileños go out harder than most. The thing is that they don’t go out every night, but when they do, they won’t be seen at the club any earlier than 2 a.m. They’ll dance and drink a little throughout the night until 6 a.m. or 7 a.m., which is likely why they tend to wake up so late. In terms of specific spots, El Sol offers dancing to either live acts or a classic rock/pop soundtrack, while Joy Eslava, a former 19th-century theater, has a dance floor for days (note: It gets crowded). Speaking of greenery, El Retiro is basically the Central Park of Madrid. If row boating in front of monuments, reading in the shade of a tree, or grabbing a drink at a terraza (open-air café) sounds like fun, then you should check this spot out, especially when it’s busy on weekends. You see, until 1868, the park itself was only enjoyed by the royal family, which is probably why it’s so elaborate (it even boasts a stunning rose garden with more than 4000 of the blooms). Yes, you read that right: There is an Egyptian tomb called Templo de Debad located in Madrid in the Parque de la Montaña. How did it come to be there? Well, the story goes that the Spanish helped to preserve historical monuments and temples from water in Southern Egypt after Aswan Dam was built. The Egyptian president gifted the temple to Spain as a thank-you for its collaboration and sent it to the country block by block. And by “tour,” we mean you should walk around the district called Barrio de las Letras, aka “Neighborhood of Letters.” It’s here that you can find quotes from famous writers like Miguel de Cervantes and Luis de Góngora written in the pavement (they used to live in this area). American author Ernest Hemingway also spent a great deal of time in Madrid, and if you’d like, you can even request his favorite seat at the Restaurant Sobrino de Botín. The real Madrid experience includes a mini tour of its architecture and Plaza De Cibeles has literally become a symbol of the city. A striking neoclassical fountain and marble statues adorn the square (fun fact: the fountain was actually more off to the side but was moved to the center in the late-19th century). It’s also the intersection of four key buildings: The Cybele Palace (aka City Hall), The Bank of Spain, The Palace of Linares, and The Palace of Buenavista, which are all gorgeous in their own right. You haven’t had a proper churro until you’ve visited Chocolatería San Ginés. The shop, which has been open since 1894, is known for fried dough dipped in what essentially is rich chocolate soup. By the way, it’s open 24/7, and the best time to go is around 3 a.m. or 4 a.m. post-nightclub hopping. Fútbol is a big deal in Madrid, and so is catching a game at the famous Santiago Bernabéu Stadium. We will warn you, though: The matches can get intense, especially when a rivalry is involved, so only head to watch a live game if you’re in a group. If you want to enjoy the sport in a leisurely way, there are bars where tons of the locals will gather to cheer their team on together. Lunch in Madrid is the biggest and most important meal of the day, and it happens right before your siesta. Because of that, it’s taken at a leisurely pace, and there is what they call a menú del día, a special prix-fixe lunch menu consisting of several courses. It’s typically reasonable price-wise and includes a soup or salad, a main dish, a side, and a dessert. Instead of going to the Rastro—a tourist trap of a Sunday morning flea market stretching from La Latina metro stop down to Puerta de Toledo—go on a weekday instead. You’ll be able to go from antique shop to antique shop with no lines (and no junk). This isn’t for everyone, especially considering that bullfighting is controversial at the moment (the Spanish parliament said it was illegal to make bullfighting illegal). Regardless, a trip to Las Ventas bullring is a big deal—you can tour the museum to learn about the history, too. The fights themselves happen at night and require an additional fee (buy a seat cushion, and sit in the shade if you choose to go). Your hotel's concierge will be able to totally hook you up with reservations at just the right restaurants, can organize sightseeing excursions, and will tell you which clubs to check out once it gets dark. Plus, they'll let you know how to get there (or call you a cab, which happen to be pretty clean and fairly inexpensive). And if you're not staying at a hotel? Ask your Airbnb host or a local at your hostel for their tips. A leisurely walk around town is a normal thing in Madrid, especially on Sunday nights. Think of it like a promenade with friends, wandering La Latina or Salamanca. Stops along the way are pretty much essential: Grab some vermouth or a round of tapas on your route. Puerta del Sol, also just called “Sol” by the locals, is the main center plaza that is a bit of a tourist hub (fountains, statues, the like). It’s always bustling, especially at night, since most of the clubs are located here. It's worth making a trip to people-watch, even if it’s just to catch sight of some street performers or protestors. What do you think? Do you have anything else to add? If so, sound off in the comments. Up next: The Greek island every fashion girl loves.